That was the reaction I had as soon as I opened the 280slides online PPT editor. Having seen and reviewed some of the best software, it is not usual for me to gasp like this. But 280Slides really left me amazed. It is hard to believe that 280Slides is a web application. It seems like a software that you have installed on your desktop. The website has been designed beautifully, and using this website is really amazing. Absolutely love it! 280Slides is a free website to create presentations online. It is completely free, and it comes with amazing features. First thing that will thoroughly impress you is the nice interface. Everything is so obvious to use in the interface. Creating a presentation online with 280Slides is a really easy process. 280Slides lets you create beautiful presentations with ease. The whole menu is very easy to use, and has a nice resemblance to Powerpoint. 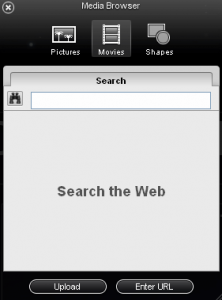 280Slides is a completely online application that works in your browser. 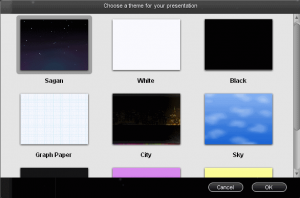 You do not need to download or install anything to create presentations for free. I tried 280Slides with IE8, Firefox, and Google Chrome. It works well in all of these. 280Slides lets you import your existing powerpoint presentations. You can then share them online, or edit them on 280Slides. 280Slides provides some nice themes for your presentations, that you can use to build stunning looking slides. 280Slides autosaves your presentations every few minutes. This ensures that you do not loose your work if you accidentally close browser. 280Slides lets you share your presentations online with your colleagues. You can just send them a direct link, and they can view the presentations online. 280Slides lets you download your presentations in PowerPoint format. So, you can create presentations for free online, and then download them in your favorite format. 280Slides lets you add free photos and videos to your presentations from popular services like Flickr and YouTube. 280Slides works as an online storage for your presentations as well. Just upload your existing presentations, or create new presentations on 280Slides and then you can download later from anywhere. A very effective to store your presentations for free online. All in all, 280Slides is just the ideal solution for creating presentations online. It is hard to believe that it is totally free. Love it! That was the reaction I had as soon as I opened the 280slides online PPT editor. 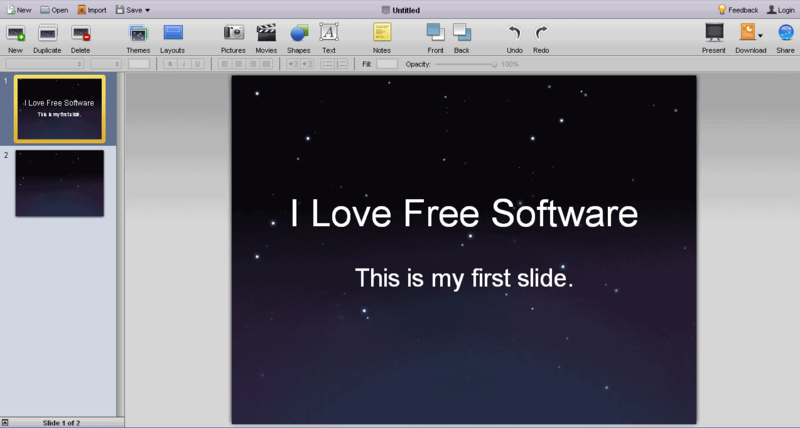 Having seen and reviewed some of the best free software, it is not usual for me to gasp like this. But 280Slides really left me amazed. It is hard to believe that 280Slides is a web application. It seems like a software that you have installed on your desktop. The website has been designed beautifully, and using this website is really amazing. Absolutely love it! Update (28-Aug-2012): 280Slides has been shut sometime last year. 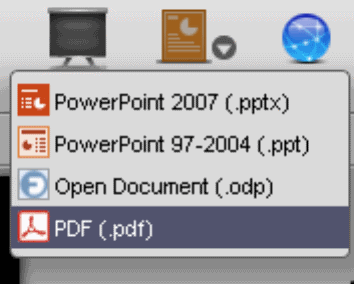 280Slides lets you download your presentations in various formats, including PowerPoint (.ppt, .pptx), Open Document (.odp), and PDF format. So, you can create presentations for free online, and then download them in your favorite format.